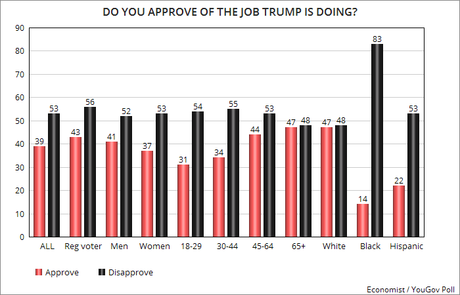 These charts reflect the results of the new Economist / YouGov Poll -- done between March 17th and 19th of a national sample of 1,500 adults (including 1,045 registered voters). The margin of error for adults is 3 points, and for registered voters is 3.1 points. 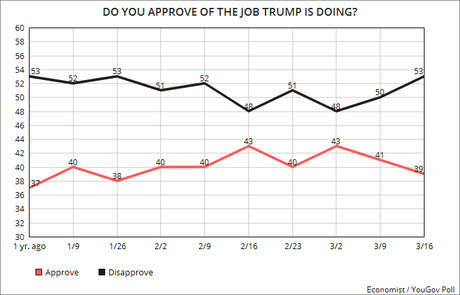 Trump has been unable to significantly improve his job approval numbers. In fact, they seem to be falling again. Currently there is a 14 point negative gap among adults, and a 13 point negative gap among registered voters.